Eamon Sweeney began his musical studies on the violin, picked up a guitar while in his teens and subsequently studied classical guitar at the DIT Conservatory of Music and Drama. While there he was exposed to the Baroque guitar, igniting his fascination with the instrument and inspiring his doctoral research into the guitar’s role as a continuo instrument in the court of Louis XIV, an unexplored area of French Baroque music. Eamon teaches and performs extensively, including giving broadcasts, lectures and seminars in Ireland and abroad. 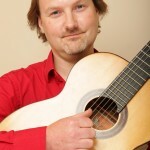 He has performed at many International Music Festivals including Sligo Festival of Baroque Music, Bath International Guitar Festival, Dundee International Guitar Festival, Guitar Festival of Ireland and the City of Derry Guitar Festival. Eamon has being fortunate to work with many of Irelands premier artists including Seamus Heaney, Róisín O’Grady, Annette Cleary, Rachel Factor, Laoise O’Brien, Malachy Robinson , Francesco Turrisi, Cormac Breathnach, ÓdhránÓ’Casaide, Redmond O’Toole and musicians of the Irish World Academy of Music and Dance. He has received numerous awards and bursaries over the years and in particular he gratefully acknowledges the support of The Depart of Arts, Heritage and the Gaeltacht, The Arts Council and Music Network through the Music Capital Scheme 2011 and The Artist Bursary Award 2012. Being deeply committed to the provision of, and access to high-quality music making Eamon teaches in a variety of contexts – Education, Community Music, early years Music and Music in Healthcare settings. He also teaches with the KWETB in Bray Music Centre and in post–primary schools throughout the county.